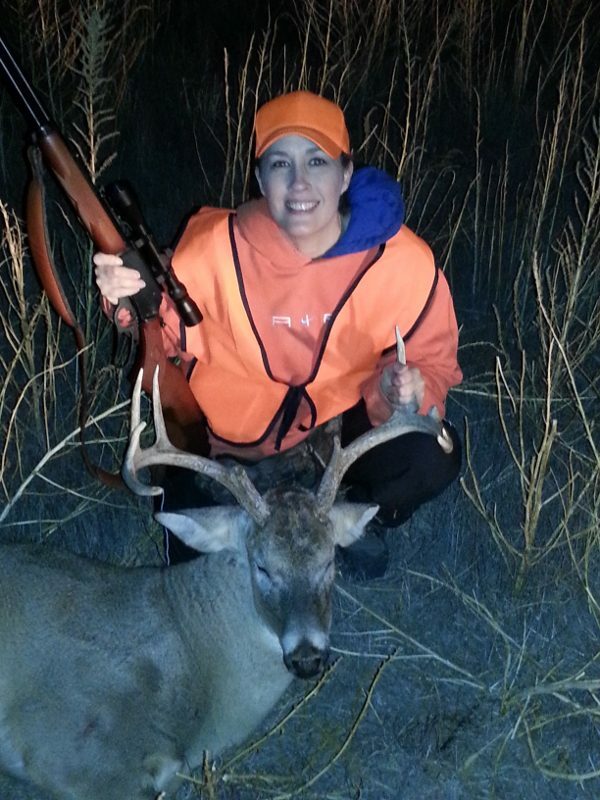 To all the hunters heading out tomorrow for opening day of the Kansas Firearms Deer Season, good luck! May your shots be straight and true. It looks to be fairly decent weather, not quite as cold as the last couple of years. This is the first time in 3 years that I’ll miss the opening! I can’t make it out until the last weekend of the season when I take my daughter out. So save a couple of deer for us alright? The title sounds pretty cool doesn’t it. It would be, if I had actually taken a deer with it! You see, I am writing to you as a failed hunter. 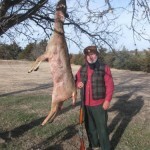 I am deerless for the Kansas rifle deer season of 2009 and it’s my own fault. See I had this plan; I was only going to shoot a big buck if the opportunity presented itself during muzzle loading season. 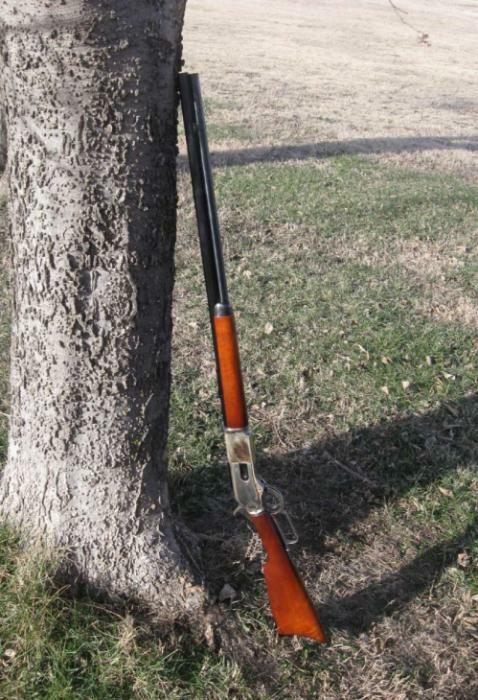 Because my plan, was to shoot a deer (any deer) with my original Spencer 56-50 rifle during rifle season. Plains Hunter, dedicated to hunting with historical weapons, I thought my plan would be cool, right? So I was not upset when I did not get a deer during Muzzleloading season. Flash forward to Opening evening of rifle season. I’m on the stand when a really nice buck (the one Bill missed during ML season) presents itself 135 yards out. I draw a bead and fire. A clean miss. I forgot to take into account the 183 MPH cross wind. Some where in Oklahoma a farmer is thinking “How did I get that giant bullet hole in my John Deere”?). Meanwhile, Dad and Jim are hunting without much success. Bill arrives Thursday and begins his tragic battle with Buck Fever. In Bill’s case Buck Fever doesn’t properly describe it. Is there such a thing as Buck Cancer? Or at least Buck H1N1? Seriously Bill should see someone. If cost is an issue maybe the Shriners can help. I don’t believe anyone should have to suffer like that. Three shots, ALL at BUCKS! Not a single doe shot. Deer know, I swear they know! 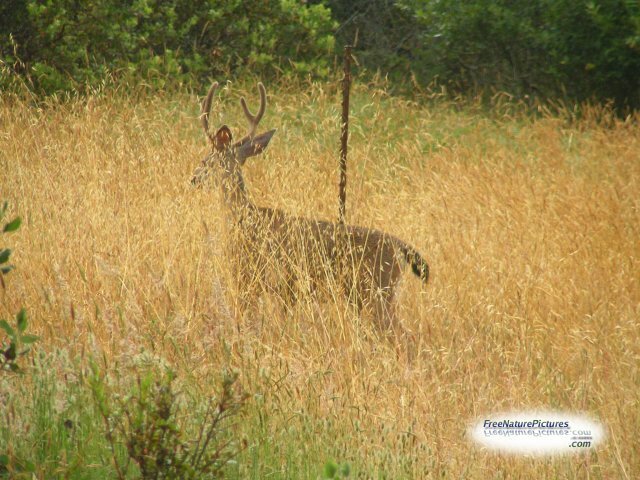 If a deer can sniff out Buck Fever maybe they can sniff out other deadly diseases. I think I’m on to something here. I’m going to contact the Mayo Clinic. Speaking of animals with extraordinary abilities; Every time I walked to any deer stand, carrying only a rifle, a pheasant would flush perfectly; RIGHT IN FRONT OF ME! But while pheasant hunting just a month ago, carrying a shot gun, DEER WERE FLUSHING EVERYWHERE! They Know!… I’m telling you they know!… DON’T CALL ME CRAZY! THEY KNOW! Uh hem.. I digress. A few days into the season I’m hunting on a different stand. Two does, a shooter buck, and the FATHER OF ALL MONSTER BUCKS is standing thirty yards away. Then the Monster walks within twenty yards and TURNS BROAD SIDE! Then he stands on his hind legs and FLIPS ME OFF! WHY? Because he is a MULE DEER and I have a WHITE TAIL ONLY license! My Dad has an either species license and Bill has an either species license. I change stands so Dad or Bill will get a shot at the muleys. Neither one sees them. After Dad and Bill return home, I return to the stand and the mule deer are BACK! I’M TELLING YOU THEY KNOW! Slightly changing the subject, I’m not much of a tech guy, Bill can tell you that. But before deer season, I decided I just HAD to have a range finder. So I bought one. Pretty neat little gadget. That’s how I know I missed that buck at 135 yards. Seems like I paid a pretty steep price for a gadget that’s only usefulness is to tell me how far away the deer was that I missed. I bought another item I thought would be a lot handier. I bought a set of insulated coveralls. And they are pretty nice, warm. The problem is that I have always worn a size XL. So I bought a size XL. I’ve packed on a few pounds lately (Noo problem I’ll lose the weight after the holidays, like I planned last year). I sure don’t want coveralls that are too big. So ultimately I paid a pretty steep price for coveralls that fit like a scuba suit. Which wouldn’t be so much of a problem, but I didn’t try putting a rifle to my shoulder wearing my scuba suit until I was sitting on the ground at my deer stand. Consequently, if …I lean back… Juuust righhht… and stretch my arm just sooo…and lean my head waaay down… I can kind of get a sight picture and almost reach the trigger at the same time. Ultimately Dad saved us from getting skunked by shooting a white tail doe. He shot it with his 50-95 1876 Winchester (I personally think Dad just put a Sheriff’s Office salvage tag on a doe that was killed in a collision with an 18 wheeler.) That 50-95 messed that deer up! The second week of deer season a cold front moved in. One would think in this day and age of high technology the weather forecasters would have better instruments. Our local weatherman stated the temperature was down into the single digits. I know for a fact that the on my stand the average morning temperature actually hovered around 77 degrees below zero. I’m not kidding, cold like that would have killed a normal man. On the last Saturday I took a friend and two of his sons out hunting. One of his boys shot a button buck with an M-14 with iron sights at 200 yards (I know it was 200 yards because I used my rangefinder!). 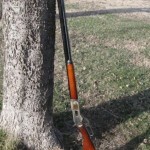 An M-14 is a historical rifle, kind of. The final Sunday of the season I rested against a fence post looking out over a milo field and watched a beautiful western Kansas Sunset. I even relaxed smoking my pipe. The wind was in my face so I wasn’t concerned anything behind me would scent me anyway. The light was fading fast so I decided to hunt my way back to the truck and leisurely set about securing my items and stood up. Just in time to see the whitetails fifty yards BEHIND me hauling away. WHAT THE *#@+!! THEY KNOW! I’m telling you THEY KNOW!! On the plus side the very historical former chicken coop (I’m not kidding) now hunting lodge has come a long way this year. We have a fridge so we no longer have to deal w/ice for beverages, food etc. And we have a TV and DVD player. Now I know many of you are saying that watching TV ruins the historical atmosphere of our hunting experience. Not True! We only watch WESTERNS! John Wayne shooting Comanches, just after the Civil War with a 94 Winchester is very authentic and only enhances our western hunting lifestyle! 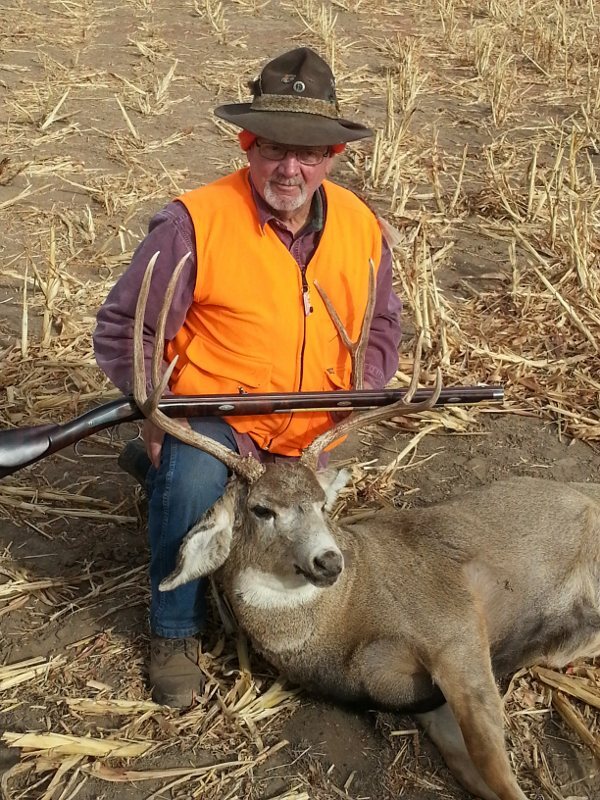 If you enjoyed hearing our tales of woe, send your tragic hunting stories to Plains Hunter. Don’t send tales of your amazing success, we don’t want to HEAR IT! Since I’m still fairly new to this deer hunting thing, I thought I might lay out a few things I’ve picked up that no one seems to tell a new hunter about. Hopefully, this can help other greenhorns out. Check the weather – religiously. I seem to constantly under-dress for the elements. And check the weather for where you’re going to hunt, not where you live as they could be different. The weather conditions can differ fairly significantly from where I live and where I hunt, and it’s only a 3 hour difference. Bring more cold weather gear than you’ll think you need, because you’ll need it. You can take stuff off if you get hot, you can’t put stuff on when you get cold if you didn’t bring it. Sorry for being a little gross, but clear all the phlegm and mucus out before you head out to your stand. Nothing is more loud than clearing your throat when the sun comes up in the morning. Learn to sit still. This is still hard for me to do. Don’t jump and look around at every little noise, most likely it’s not a deer, but the sudden movement can tip them off if they’re sitting in the margins looking around. In the area I hunt, the deer definitely have have schedules. They seem to wander through the same fields and waterholes about every 2-3 days. This last season, the buck I missed was on a 3 day schedule. Keith picked it up, predicted they’d show that Saturday night, and they did. I had suspected this, and started watching this myself. Other hunters I’ve talked to have said the same thing. But I don’t hear anyone talk about it, even in the hunting magazines. Now if I can just figure out 2 stands that have deer traffic on alternate days, that would be awesome. Those are just a few things I’ve picked up the last couple of hunts. What other tips have you picked up along the way? Leave your tips in the comments. Image courtesy of Free Nature Pictures. 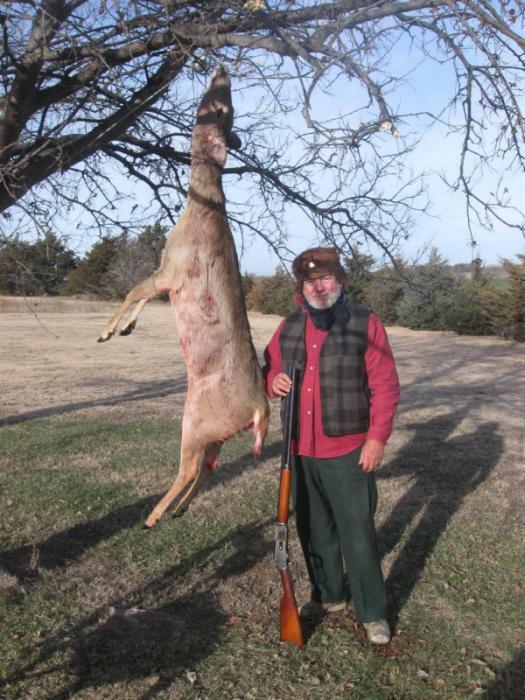 Well, the opening of muzzleloading deer season didn’t turn out as I had hoped. The weather hadn’t been as cooperative as I had wanted, which kept the farmers out of their corn fields. 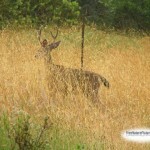 Which in turn, kept the deer in the corn fields. So, unfortunately for me (but not for the deer), I didn’t see any through the last few days of the hunt. I was a bit apprehensive on the first day since none of the corn fields were being worked on when I got there. But that first morning, I saw 5 mule deer does running about 200 yards out from where I was sitting. They never did come into my area that day, but I had hopes for the remaining 4 days. The second day was different though. I had a doe come running by me right after sunset. She was about 40-50 yards out. I decided to let her go since I still had 3 days left. Bad decision. She was the last deer I saw during the day for the rest of the week. I sat on a different stand the next day, came up empty. Went back to my original stand on the 4th day. Nothing. I saw more deer at night driving back to camp then I did during the day. It was certainly disappointing. But hey, that’s why it’s called hunting and not getting, right? I would love to go back this weekend, as I’ve heard that a few farmers are cutting the corn. Not sure if I have the time or not. Most likely, I’ll be back out there in December during rifle season, braving the cold again. Believe me, I’d rather fight the mosquitoes than the frigid cold temperatures like last year. There’s always next time. Keep your powder dry. 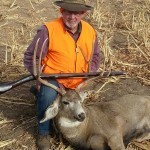 It seems the guys over at Addicted To Hunting had a big Muley in their sites. There are Mule Deer running around in our area as well and I’m hoping to see some when I get out next week. Doubt we have the snow that those guys did though! Talked to my partner and he’s stoked about the upcoming hunt. The first part of the week will just be the two of us and another couple of friends will be coming out for the weekend. I hope they got to see the big Muley, nothing is more exciting than seeing a huge buck in front of you. I can’t wait to see the follow up to their storey.